Guru Rinpoche, or Padmasambhava, is the founder of Tibetan Buddhism. He is known by many names including, The Lotus Born and The Master of Oddiyana. 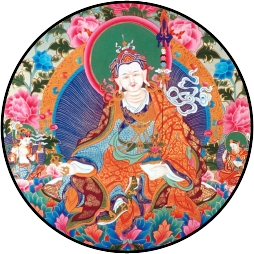 In the Nyingma tradition, he is considered to be a second Buddha. He was the greatest tantric adept of his time, having fully mastered all of the esoteric teachings and practices of Indian Buddhism. He received oral instruction and transmissions for many masters including all of the teachings of Dzogpa Chenpo from Shrishima. He arrived in Tibet around the year 810 CE, at the invitation of King Trisong Detsun. Through miraculous powers, realization and scholarship he, along with other masters such as Vimalamitra, established the Dharma there. Among his many accomplishments were removing all the obstacles to the building of the first monastery of Samye, as well as pacifying all of the human and non-human forces that were opposed to the Dharma. He also gave countless teachings of sutra and tantra, bringing many of his students to the state of enlightenment. Guru Rinpoche and his consort, Yeshe Tsogyal, traveled all over Tibet, performing sadhanas, giving blessings and concealing ters, or treasures of realization, that could be discovered by future practitioners. This ensured the future of the Dharma in Tibet for many centuries. The discovery of these ters, which are fresh realizations directly from the mind of Padmasambhva, continues today.